Philanthropy has long been a critical part of relationship building and creating member loyalty. What Millennials and current events are showing us is the rise of, “cause-sumption.” Consumption of goods and services based on affiliated causes is an increasingly important part of how consumers make choices. An easy way to keep up with this trend is with charity flexible incentives such as gift cards. According to Horizon Media, 81 percent of millennials expect “good corporate citizenship” from companies. There is the popularity of brands with cause-based mission statements. Toms, who provide shoes for third-world children, is a key demonstrator. Also notable are branding shifts in established products such as Dawn dish detergent. Their new focus is to highlight the charitable causes with which they are affiliated, above all else. Dawn has changed their branding to highlight their beneficial impact on wildlife. We can see the rapidly changing pulse of social causes. Recent flooding events and corresponding news coverage highlight this. From rebuilding schools in New Jersey to rebuilding lives in Louisiana, current charitable motivations are fluid. To best meet those changing motivations in consumers, an incentive which allows the most flexibility in use is key. 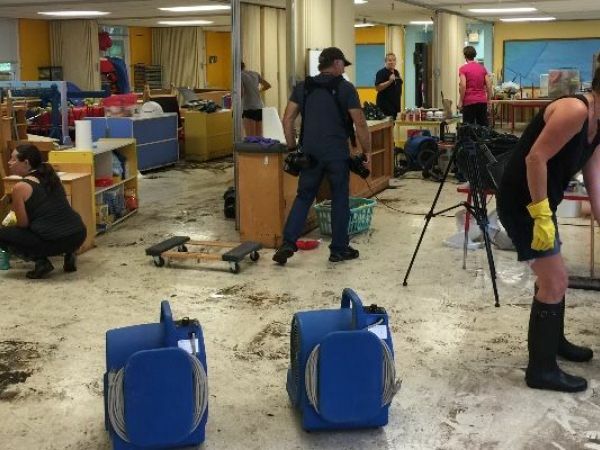 Volunteers help restore a flooded preschool in New Jersey. In addition, many donations were received, including gift cards to buy additional supplies. Inserting the option of charity is all but pre-built with the gift cards’ flexibility. E-gift cards can be donated directly to charitable organizations online or over the phone. 3rd party gift card brokers can be used to facilitate the donations. All your business needs to do in order to show its good corporate citizenship is to inform your customers of the charity flexible nature of your existing incentives. Most importantly, this method of civic participation allows your customers and members choices. The option to choose how, when and if they get involved is based on their own needs and motivations. Contact a gift card fulfillment firm such as Promotion Vault to begin meeting consumer expectations today.